Armed with Linux and Open Source tools, you can even keep an ISP secure. Decreasing the vulnerability of your DNS server is largely a matter of staying current and private. Improve your site's e-mail hygiene and make life difficult for spammers and hackers. The time for security excuses is over. In the first part of this three-part series on real-time audio synthesis we take you through the history and basis of RTcmix. A guide to setting up user authentication for the Apache web server running on Linux, using the plaintext file method. There is more to the Internet than sending JPGs. 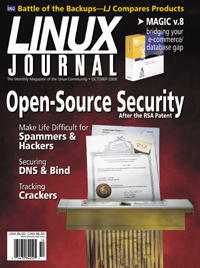 See how Linux and the MBone addresses the nedds of distance learning. Need to load Linux on 100 workstations? Learn some tricks and techniques that could save you days of tedious work. Learn how to save disk space with this open source tool for embedded systems.